CubeSats are a miniaturized type of spacecraft composed of multiples of 10*10*10 cm cubic units (1U). CubeSats can go from 1U to even 12U Units and beyond. The revolutionary CubeSat project is quite young although by now it is visibly diffused: it started in 1999 when Professor Bob Twiggs (from Stanford University’s Space Systems Development Laboratory) and Professor Jordi PuigSuari (from California Polytechnic State University – Cal Poly, California) created a design standard for picosatellites, able to reduce costs and time, hence increasing accessibility to Space and frequency of launches, in this way providing access to Space for small and economical payloads. From hands-on educational training tools (as University satellites) CubeSats have become used in constellations all over the world and their missions have been containing scientific and IOD payloads, not only for academic but also for commercial purposes, achieving high performance at a fraction of the cost of bigger satellites. CubeSat have also seen their applications widening: from space research and experiments in bio-medicine to testing new space technologies, being suitable to photograph Planet Earth from above (Remote sensing – Earth observation), perform tasks of terrain surveillance, navigation and communications (such as amateur radios but not only). GAUSS has gained a great expertise in the CubeSats design, manufacturing and launch. Accuracy and reliability of CubeSat activities have grown over the years: from their design to the development process, from integration and environmental testing to documentation, performing fit checks and developing suitable subsystems including On-Board-Computers and Space Radios. Infact, GAUSS offers solutions for 1U, 2U, 3U(+), 6U, 12U CubeSat structures.Designing CubeSat deployment systems and launching them on-board UniSat small spacecrafts means for GAUSS having earned a primary role in the CubeSat Community. The Company also regularly organizes a series of ad-hoc Conferences that bring together SmallSat Industry and Academy. By designing and manufacturing CubeSats releasing platforms, like the UniSats satellites series, which are at the same time picosatellite carriers and launch platforms, GAUSS contributed in giving more and more visibility to CubeSats and broadening their use; it has now become a significant player in the CubeSat field. GAUSS has a long tradition with CubeSats. Starting in 2012 with UniCubeSat-GG, when GAUSS was still part of Sapienza University of Roma, then in 2013, after the creation of the Private Company GAUSS Srl with the launch of UniSat-5 which carried into Space four CubeSats and four PocketQubes, then in 2014, when UniSat-6 was launched, deploying four CubeSats (among them were one of the first prototypes of LEMUR CubeSats by Spire, which now owns a CubeSat constellation covering all Earth) and in 2017 GAUSS launched the TuPOD from the ISS, which was the first CubeSat ever designed to carry in orbit and then release two other pico-satellites, named TubeSats. The Company is currently preparing UniSat-7 mission, which will include a number of CubeSats as payload. 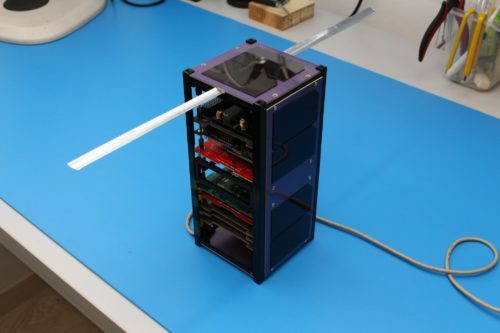 CubeSats can be put in orbit by using UniSat satellites as releasing platforms, or they may be launched as secondary payloads from a launch vehicle system via a deployer system fixed directly to the vehicle. GAUSS developed a specific deployer for CubeSats, capable of carrying standard CubeSats, the GPOD. It is available in 1U, 2U, 3U, 3U+ and customized versions. G6POD is GAUSS deployer system for 6U CubeSats, while Q-POD is GAUSS release system for 12U CubeSats. For more information, please contact us at: info@gaussteam.com .